WILLEMSTAD - This tiny island in the Caribbean did it again. Curaçao wins the Senior League Championship against Delaware. Pariba Little League of Willemstad overcame a first-inning two-run deficit to down Delaware 7-2 in the championship game. Delaware came out swinging and scored two runs in the top of the first inning on singles by Sam Gise and Will Davis, two walks and Adam Tommer’s sacrifice fly. Jake Andreoli and Sully Williams then opened the Delaware's second inning with singles, but outs were made on the next three batters. Curaçao then answered with four second-inning runs and tacked on three more in the fifth to pull away for the win. Curaçao champs had seven hits. Winning pitcher Elchero Fransisca allowed five hits and struck out four over six innings. Delaware was plagued by an uncharacteristic six errors in the game. Shane Quant induces the groundout for the final out in the 7th, sealing the win to clinch the Senior League Championship for Curaçao. 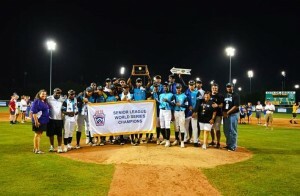 Curaçao had also won the 2002 Senior Little League World Series and finished second twice since.